The night before, I was looking at a map of summits in Santa Clara County and noticed there were two closely-spaced points just off Skyline Blvd (SR35) in the Santa Cruz Mtns that I'd not yet been to. They are exceedingly minor summits with very little prominence and certainly no views, but somehow I woke up in the morning thinking about them. I ate breakfast and did a few chores, but somehow it stuck in the back of my head that I ought to go check them out. Whatever types of neurotransmitters were swimming around my brain, I imagine this is exactly the sort of thing that takes hold of a drug addict, unable to get the thought out of mind, eating away at you until you give in and take that next fix. So I told my wife I was going out for a short hike and headed out for a 30min drive. SR35 just east of Bear Creek Rd becomes a very narrow road that winds along the crest of the Santa Cruz Mtns towards SR17. There are a number of rural homes found along both sides of the road in many places and with no shoulder for most of its length. Finding a place to park is not so easy. I found a spot to the west of where I wanted to start, near the intersection with Upper Zayante Rd. I then walked east along the road to a saddle between Van Lone and Peak 2,220ft that I had identified beforehand from Google StreetView. Google Maps incorrectly shows an Xmas Tree Farm at this location - there is no such thing. Instead, there is a locked gate signed for Area Closed by the Peninsula Regional Open Space District. Much better to go through here than private property, I reasoned. I followed an old logging road uphill to the northwest for about 1/6mi to the top of the forested Mt. Van Lone. 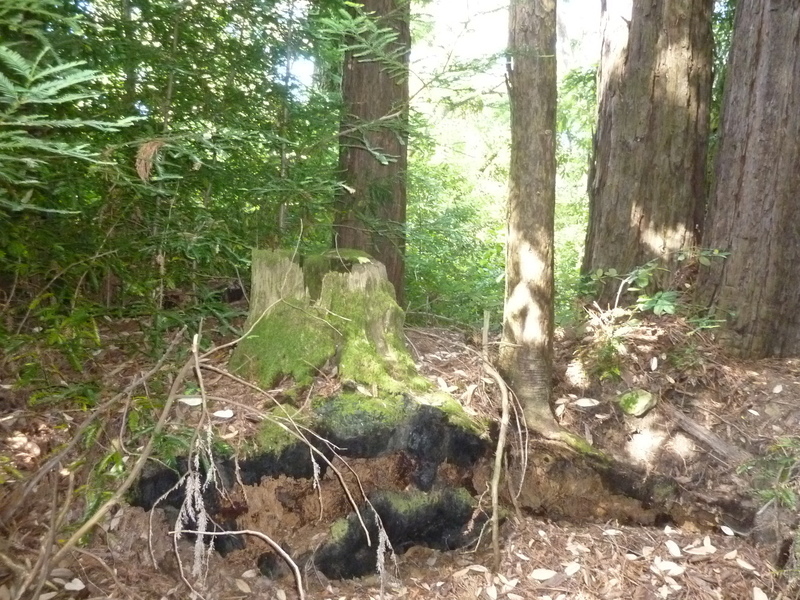 The highpoint is just east of the road among some second growth redwoods. A trivial peak, it turned out, but almost as soon as I started to think this would be a very short outing, the second summit demonstrated just how tough the Santa Cruz Mountains can be.